Saguaro cactuses tower over the mesquite and paloverde trees, wild poppies and other plants that spring up in the desert landscape. In the background, the Catalina Mountains stretch upward toward an overcast and gray sky. White domes bubble up from the red-clay earth as blue glass glistens on a giant pyramid. 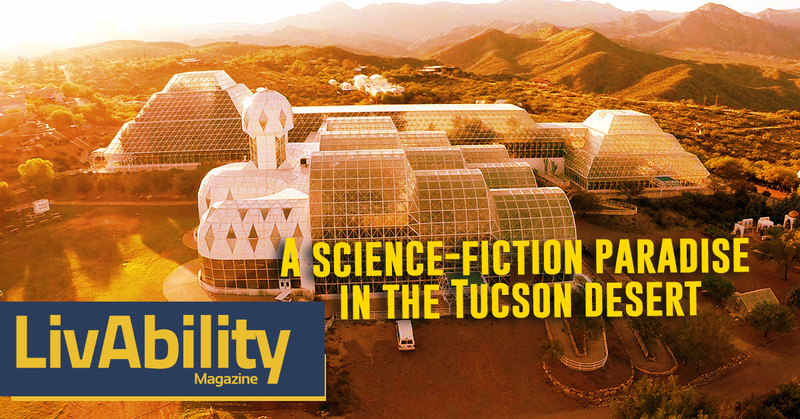 What looks like it should belong in a science-fiction movie stands juxtaposed against the Tucson desert. A surprise hides in a small valley at the foot of the mountain. The Biosphere 2 was created in the early 1990s as a science experiment to see if mankind could one day colonize another planet; it no longer serves this purpose. In 2011, the University of Arizona assumed ownership, and it’s now the world’s largest earth science experiment. This is Biosphere 2’s focus today, reaction to change. Here, scientists from around the world come together to study things like drought effects on plants, soil compositions and even selective breeding of coral. 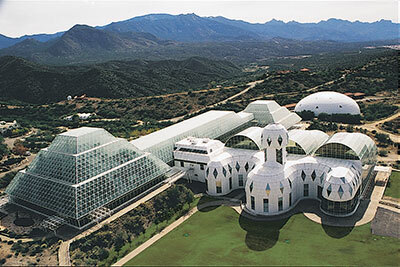 Biosphere 2 has many different ecosystems, open to the public for 90-minute tours. These ecosystems include a desert, an ocean, rainforest and even mangroves. For those needing special accommodations, specialized tours are offered. The facility asks that those who may need an adaptive tour call at least five days in advance to ensure that sufficient educational specialists (tour guides) be on campus during the visit. Kasey Kaler is the editor of LivAbility magazine. 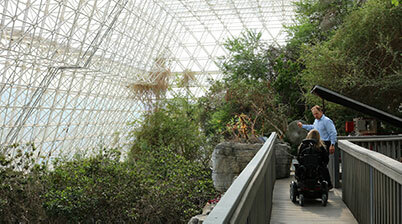 Kaler uses a power wheelchair and took the specialized tour of Biosphere 2. “If we were going up ramps, or anything like that, most of the areas had grab bars. So again, you could pull yourself up if you were in a manual wheelchair,” Kaler said. The tour is about a mile and a half in total. To begin the tour, guests have to make their way down a series of ramps. To someone who uses a manual wheelchair, it would be a good idea to bring someone along to help push on the way back up. If a person is able to walk, but not for extended periods, the center offers manual wheelchairs. The facility has worked incredibly hard to make sure it is up to ADA standards. However, there are a few ecosystems within the biosphere that are not accessible. The university is working on a solution to overcome this problem. “The parts of the tour that haven’t been made to be accessible yet. they’re going to be introducing virtual reality tours,” Kaler said. 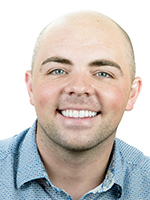 Adams confirmed that VR tours will soon be part of the ADA version of the trip so that visitors with limited mobility will be able to fully experience the tour. 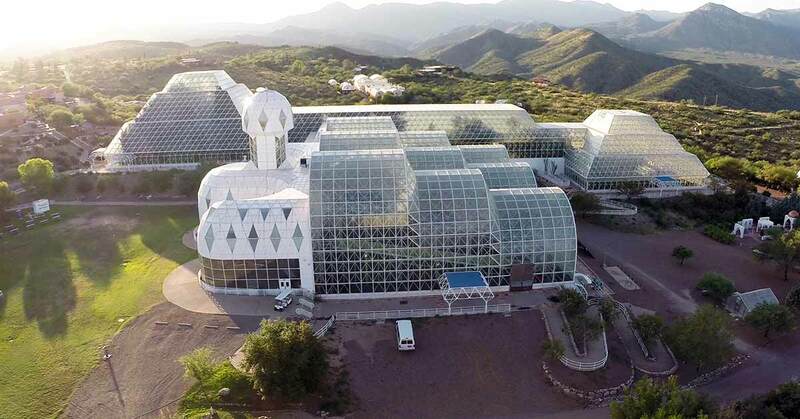 Biosphere 2 employees aim to ensure that everyone who wishes to learn about the different ecosystems of Biosphere 1 (Earth) will be able to do so during a tour. 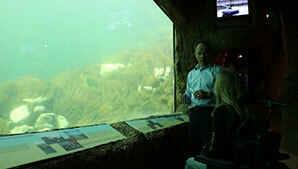 Every ecosystem and even the mechanics that control the airflow of one of the ecosystems are open to the public. Guests feel the humidity of the rainforest, smell the salt of the ocean, or catch a glimpse of a giant mechanical lung. All of this to help people of all abilities learn how they can help preserve the world we call home. “You start to look around at the species here [in the Biosphere 2] and we don’t have things like that [in Arizona]. These trees and these plants, we don’t have that, so it was a really cool experience,” said Kaler.